We return to our Developer Showcase blog series, which serves to highlight the work and motivations of developers, users and researchers collaborating on Hyperledger’s incubated projects. Next up is Hrishikesh Nashikkar, blockchain lead at Broadridge. Let’s see what he has to say! Blockchain is emerging as a huge collaborative innovation that has powered a paradigm shift from centralized applications to decentralized/distributed applications. Firstly, the important aspect is a change in the development mindset. As we move applications from centralized to decentralized/distributed world, the development mindset needs to be changed as well. The solution to a problem may work perfectly in the centralized world, but may not work or even be suitable in the distributed world. For example, the matching logic in the current world business workflows will not be necessary and it can be completely re-designed in the distributed world by multi-party approval process where one party submits a transaction and other party approves/rejects, another example is, the existing data models will no longer be viable as we build granular data privacy requirements and require new data models. Second, the technology is certainly not fully matured and still has several complex unsolved problems such as scalability, data archival and interoperability which need to be solved for before it can be productionized. Technologists should grab this opportunity to solve the problems and this brings with it immense learning, experience and a chance to innovate. Third, we are seeing the technology rapidly evolving in both public and private blockchain space. As a developer, one should be open to both public or private blockchain implementations, both have subtle differences but it’s always helpful to be cognizant of pros and cons, design patterns, and application while implementing the use case. 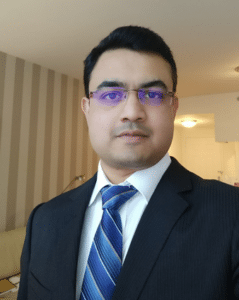 Two years back, I started my journey with Hyperledger Fabric at Broadridge and we’ve always been at the forefront of experimenting with the latest version and testing Fabric for real-world use cases in the financial services. We believe some of the specific privacy, asset modeling requirements in the financial services are very critical to productionize the solution and we as technologists continue to provide the feedback or suggestions to the Fabric community. With this emerging technology, it is very important to share learning and best practices that mutually benefits the development community. I am currently working in Broadridge Blockchain Centre of Excellence and leading our efforts on Hyperledger Fabric and post-trade blockchain based projects. Broadridge is the global fintech leader and plays a crucial role at the center of the financial services industry. We have been driving innovation and adoption of new technologies like Machine learning, Blockchain, Robotic Process Automation to solve real-world problems. Blockchain is one of the key technologies in our innovation strategy. We believe, Blockchain offers a high level of transparency, auditability, data privacy and security and this will certainly bring significant value-add, cost-saving and operational efficiency to our clients. Given my background of a developer and subsequent exposure to the financial markets as a Business Analyst, Blockchain seemed like the next best choice for me as a career, as I can combine both of my skills to deliver next-gen solutions in the financial markets. We at Broadridge have been extensively using Hyperledger Fabric for our internal POCs/Pilots since its initial versions. Recently, Broadridge announced the successful completion of a pilot with Natixis and Societe Generale which leverages blockchain technology to enhance the operational efficiency, reduce risks and auditability of bilateral repurchase, or repo, agreements. The Bilateral Repo solution is for Broker-dealers and Buy-side firms that automate end-to-end processes, streamlines the repo agreement and confirmation processes, offers a faster and more accurate collateral substitution, valuation process and other mid-life events, while eliminating time-consuming manual interventions, and reduces counterparty risk while increasing auditability. We have utilized Hyperledger Fabric v1.0 to facilitate private/permissioned network between Broadridge and its partners in the pilot. Overall, my experience is – Fabric has performed reasonably well with our pilot requirements during the testing, despite showing few pain points of an emerging technology. The development community has been very supportive and quickly helped us on the critical issues. I think blockchain is rapidly evolving through enterprise, open-sourced or consortiums based developments. Many blockchain frameworks are available in different flavors, sizes and complexity levels. One of the key requirements is interoperability between different platforms. Various blockchain based application development projects or initiatives are being developed in silos. We see mixed opinions on the different blockchain frameworks and it is difficult to pinpoint the winner at the moment. It’s quite apparent, we’ll witness different blockchain frameworks being used in the industry. This leads to few important questions. How will different blockchain frameworks co-exist and integrate with different standards of networking, data privacy and security, identity or crypto specifications, assets, smart contracts? Another critical question is – how do we manage interoperability between different legacy systems and new blockchain platforms with complex business logic and data storage? These questions become increasingly important when we set our path to productionize the use case and network with multiple participants with their own choice of blockchain technology. Obviously, some of these questions are being brainstormed or addressed to a certain extent. But, secure, robust operational designs and common standards need to be incorporated to build the strong ecosystem for the future. I believe, Hyperledger is playing an important role as a technology incubator in the industry and has multiple cross-industry blockchain projects under its umbrella. Hyperledger is the best platform to start addressing some of these problems and build common standards across different blockchain frameworks.